The afternoon was overcast and a moment later it was raining heavily. In the not-so-extensive library room, a group of audiences had sat sweet and relaxed, waiting for Anthony Chen’s Ilo-Ilo to be screened. This 100 minute movie, apart from the numerous awards it earns, is worth talking about. The film itself is set in 1997, which we know at that time countries in the Asian region experienced a terrible economic crisis. The economy is paralyzed, unemployment everywhere, and Ilo-Ilo recording all of it through the simple relations of the employer and the maid, binding his characters in socio-economic relationships which then changing meaning over time, into a strong psychological relationship. Ilo-Ilo tells Hwee Leng (Yeo Yann Yann) a woman who is pregnant but still has to work. Meanwhile, her husband Teck (Chen Tianwen) who initially has a permanent job but then laid off and had to work hard in situations that are difficult at the time. Meanwhile, Jiale (Koh Jia Ler), the only child of the puppets they have, has many problems at school due to his own misbehavior. When both parents are required to work, then they decided to hire a servant Teresa (Angeli Bayani) who is a Filipino citizen who is also struggling to support the child and his family. Initially Teresa gets unfavorable treatment from Jiale, but all of that then turns into a close and intimate relationship. But the family must accept the facts and make difficult decisions about Teresa’s existence among them. SEA Movie which is a monthly screening program at PSSAT UGM this time also presents two speakers that were Dyna Herlina who is a lecturer at Communication Science State University of Yogyakarta and Ros Amirah who is a student of National University of Singapore. By presenting the two speakers, this film is not only seen as a spectacle but also as a medium that can describe the reality, even provoking the audience to go further, either about the film itself or the issues that are displayed. The film is a storyline that offers a very interesting drama. However, this film is certainly not only understood as a film that tells the relationship of maid and mere employer. There are many pieces that bring the audience to other dimensions and realities. 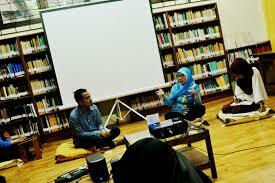 This was then emphasized by Dyna Herlina when the SEA Movie discussion session began. Herlina emphasized sparkling, which she thought the film contains “sparkling (flashes, sparks) or pieces of information that would be meaningful if supported by other films or reading books about the situation in Singapore. I found that this Ilo-Ilo film contains topics splashed on the audience “. Herlina emphasized the number of sparkling she encountered and felt in this film. If the film is seen as a film that represents Singaporean society, then the use of Singlish (Colloquial Singaporean English) is important. Looking at the efforts of the Singaporean government to promote English as a national language (good and right) in the form of a number of slogans in public areas, the use of Singlish in the film is like reinforcing that that’s how Singaporeans communicate. Then the film also talks about space. This film describes how the space is interpreted by the people of Singapore, such as the clothes hanging on the balcony and should not fall because the houses in Singapore shaped apartment buildings at least 5-story, smoking bans in certain places, and boys who sleep with domestic workers. Even if it is associated with the cinematographic element in the film, the use of fast-moving cameras also symbolizes how space and even time in Singapore’s society is understood. There is no time to relax. The film also talks about the westernization of Singaporean society. There is an attempt by the Singaporean people to decentralize themselves in the use of English. The Singapore Government has determined that English is a national language, although today Mandarin is also a language that must be mastered as a demand in work for example as Amirah says. Then the issue of suicide also became an issue featured in this film. Picture the situation of the people of Singapore which has a high suicide rate is not only used to reinforce the story but be able to record a tension and level of public depression due to economic weakening. Amirah added that until now the case of suicide is still common and even still quite high. Apparently the case was related to the massive dismissal of the time. It also relates to the quality of worker (hire qualification). The reality is that Singapore is the urbanization center that makes it a dream country for job seekers especially for foreigners, but on the other hand it also imposes strict competence for Singaporeans themselves. The element that is also important to be discussed is religion. The film provides an overview of Singapore’s public relations and religion. There is a narrative denial of religion and a death ceremony to be a wonderful thing to think. For Herlina, this film religion is displayed in a narrative that has been separated and not binding for the people of Singapore. In this film also the authors can assume that the notion of important and unimportant religion is the tendency of more modern and liberal urban society. Bearing in mind that the film was set in 1997, so the Singaporean community life at that time has reached the stage of modernity when compared to other countries in Southeast Asia. The film also raises the issue of violence against children, discrimination and also friendship or intimate psychological relationships. Parents in this film are described as very disciplined with a regular life. But it leads to violence, and also directs children to violence in schools. Discrimination is also a strong issue against migrant workers. There is a scene where a helper must sit outside during the employer’s family event, even a maid should wear certain clothes that should not be better than the employer. In addition, the stereotypes of migrants in Singapore are also so high. Whereas the migrant workers could be people who come from the educated and have the status of upper middle class in his country. However this film is also neutral to friendly relations. The possibility of an intimate relationship can be established between the maid and the child of her employer. Even employers can treat helpers as part of family members. Herlina also observes that this film shows a present culture of money in Singapore society. There are two scenes that indicate that the prize is in the form of money put into the envelope. The scene in which the Hwee Leng family attends his mother’s birthday and the moment when Jiale gets a small envelope of money that his mother keeps. Amirah added that Singaporeans have fears about the economic crisis. The fear is defined as lack of money. So they prefer to give money as a gift (also influenced Chinese culture) and put saving money instead of spending their money. Even in this movie, it also describes stocks and lotteries in common. Both are played with prediction, loss and profit, and player must think quickly in making decisions. This movie based on its own title means having no father and no mother or orphan (ilo-ilo is also a curse but more subtle meaning). In uncertain economic conditions, by seeing this film itself, then everyone in the film is like orphaned people. Nothing can guarantee the life of tomorrow (which for the people of Asia, the figure of a parent can mean a relationship not only as the intimacy of parents and children but also can be seen as the togetherness that ensures life in the future). Children depend on their parents and vice versa, children are responsible for the life of their parents. However, in Ilo-Ilo it is questionable. The economic crisis leads everyone to be able to save themselves which means to work harder. Unfortunately, it then erodes a gradual meaning of family relationships that can still be felt within a short time between Jiale and Teresa. But it must be completely eliminated from Jiale’s memory, that it is unreal. Or maybe then the memory seemed to reassure, if you want to feel it back there, work diligently! The people in the film are then portrayed as lonely. There is no time together to simply sit back and discuss the trivialities that every family relationship sometimes needs. Jiale only met with his mother-in-law when going to bed, even when the weekend relationship is on the dining table with a meal that is not delicious. Then it just finished. On the other hand, Teresa is also a mother who misses her son, is far apart and can only contact her son by phone. Migrant workers are jobs that make everyone homesick, but must be able to survive and work in a country, putting aside the feelings they feel. If this film can depict the people of Singapore and also can predict the people of Southeast Asia in the future, then be prepared for you, oh Ilo-Ilo ha !.